I think it was somewhere in Scandinavia—Stockholm? Bergen? that delightful little community on . . . which fjord was that now?—but I’m not even sure about that.Why can’t I identify the hotel that delivered so brilliantly on this fundamental aspect of a hotel’s worth? Because all the possible contenders that come to mind were excellent. (All right, the picturesque fjord establishment that inflicted fried, breaded salmon on guests who had no other local dining choice didn’t quite hit that mark, but aside from its culinary shortcomings it was terrific). Places that pamper their guests with comfort and pleasure have so much going for them, it’s easy to conflate them when time dims memory. Never, however, have I forgotten the key facts about a hotel that failed to live up to the basic definition of what it was meant to do: shelter travelers—protect people away from home from the elements and from human and animal predators, and provide them with reasonable conditions for sleeping and refreshing themselves before they continue on their way. The first time I encountered a place that didn’t meet these criteria was during high season in the magical city of Venice. It was already evening by the time I arrived in town and I spent hours looking for a place to stay. Relieved and wiped out when I finally found one, I went to bed immediately, turned out the light, and fell asleep. Suddenly I was awakened by a “pick,” then another, and another. Scarcely awake, I flung the mattress onto the floor and tumbled back down onto what I thought was a covered box spring, only to bounce off again, unpleasantly poked, this time by bare metal springs. With nowhere to stretch out I huddled in a corner, sleepless, the entire night. Compared to the next example, however, that establishment was a paragon of the hospitality industry’s professionalism and virtue. One beautiful summer day we arrived in Nice, eager to get to the beach. At the Syndicat d’Initiative a well-informed, efficient tourism associate gave us the names and addresses of several hotels that were a good fit for what we wanted and told us the closest one was just down the steps across the street, in the block on the right. This was one year before the suitcase on wheels was invented. With the loads we were carrying, “closest” sounded good to us. We arrived at a gracious Belle Epoque building with elegant colonnades, decorative wrought iron balconies, and a landscaped interior courtyard that promised quiet hours for reading and writing. The clerk at the front desk gave us a room overlooking the street that had period furniture, a lovely color scheme (oh, that beautiful, light blue bedspread! ), and one of those splendid balconies. We’d struck it lucky. The hotel’s architecture and room decor were so pleasing that for years, on our many return visits to Nice, we never even considered staying anywhere else. If the trip was to be a brief one, we’d take up residence there for the entire visit. If we planned to rent an apartment and remain in town for a while, it served as our initial base. But content as I was with our choice, I also found that although the hotel was a standout in terms of physical attributes, it lacked the most basic feature establishments vying for the tourist trade have to offer—genuine hospitality. There was no sense of welcome. Even dependable, solid members of their clientele like us felt no warmth or friendliness beyond the formal politeness of business. Attractive as its public spaces were, the guests, I noticed, didn’t use them much. I could see why—it was hard to fantasize “belonging” in such classy surroundings. Nothing about them suggested the comfort of a “home away from home.” Something about the place was off—the hotel didn’t seem to bear much relationship to the human world we lived in. I found this strange, but it had no effect on the pleasure I took in staying there. On the following trip, after several enjoyable days, we were getting off to a late start when suddenly we heard loud gurgling from the bathroom. We rushed in to find a nasty fountain of brown waste spouting up from the drain into the bathtub. It was indescribably revolting. The manager, a reserved, correct, stylishly dressed bourgeoise of a certain age with erect posture, was at the desk when we came down for an explanation and a fix. My husband, who had once been a health inspector, was not about to let her get away with this cavalier response to such a serious health matter. He asked her to give us another room. When she told him that was impossible, the hotel was complet, he pulled out his credit card and told her that, in that case, we’d check out. Most of the following is an approximate representation of their final communication, but the last line is the manager’s words, verbatim. With a grimace, she printed out the bill and handed it to him. He read it and handed it back. “I’ll pay for the first three days, but I will not pay for today. Water’s essential—this is a public health hazard. We can’t brush our teeth, we can’t wash our hands, we can’t take showers. I can’t even wash down the aspirin I need for the headache this has given me! “Get out of here now! And don’t ever come here again!” she screamed. A free pass on the bill resulting from her fury was not adequate compensation for having had to endure such an extraordinarily disagreeable hotel experience. Nor was there any need to bar us from the premises. We’d rather have curled up on the hard, bumpy galets that serve in place of sand on Nice’s beaches and washed ourselves in the chain-pull, outdoor cold shower than ever step again through the beautiful arched doorway of that menace of a hotel this wretched woman presided over. We found other comfortable hotels in Nice and to this day we still enjoy them. They have less architectural panache, but they have style and art and they offer warm hospitality that we genuinely appreciate. Last month our most recent favorite served not only as a haven but as a buffer for my shocked sensibilities when, by chance, I discovered the reason why that first hotel had always seemed to have something wrong about it. We were about to return home. I’d finished packing and was relaxing in our comfortable room overlooking a garden of which we’re very fond, reading Nice Matin, the daily newspaper of the French Riviera, until it was time to leave for the airport. Local news, national news, concerts, theatrical events. Then, on the next page, an interview with Serge Klarsfeld, the internationally known Nazi hunter. In it he appealed to voters to defeat the Front National in the first round of the coming elections by voting for the candidate most likely to win, regardless of party. Strong measures were essential, he insisted, because the FN remains extremist, racist, and anti-semitic despite Marine Le Pen’s assurances to the contrary. The need to defeat this party, with its strong fascist roots, is so important, he declared, that if Marine Le Pen wins, he and his wife will leave France and go into exile, probably to another European country, to continue the struggle. Below the interview was a box stating that Klarsfeld was on the Côte d’Azur to commemorate the seventy-second anniversary of the day his father was rounded up in Nice by the Gestapo, taken to the Hôtel Excelsior, then deported to Auschwitz, where he died. Hôtel Excelsior. 19 Avenue Durante. That was the hotel my husband and I so happily ensconced ourselves in twenty-six years after Arno Klarsfeld’s arrest. The hotel from which we were so unceremoniously banished some twenty years later. 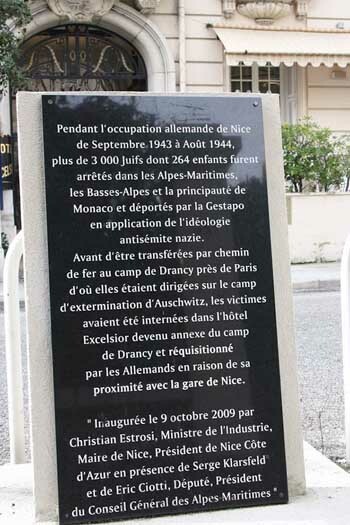 As Robert Kanigel described it in High Season in Nice, after the Germans occupied Paris, Jews from other parts of France and from all over Europe flocked to Nice which, with its many hotels and rental accommodations, was well equipped to house refugees. In 1942, the German army was ordered into most of Unoccupied France which Vichy had been governing. Southeastern France, including Nice, however, was turned over to fascist Italy. Unlike the Germans, the Italians did not persecute and deport the Jews; they protected them. When the Allies invaded Italy in 1943 and the Italians capitulated, the Germans took over Nice and established their administrative headquarters in various hotels. SS officer Captain Alois Brunner, Adolf Eichmann’s assistant, whom Eichmann considered his “best man,” set up his operation for overseeing the final solution of “the Jewish problem” in the Alpes Maritimes in the Hôtel Excelsior. Brunner’s men rounded up Jews in hotels, streets, markets, and in the train station and marched them to the hotel. They also followed up on the tips provided by the many informers, who were paid, sometimes handsomely, for their leads. These captives they brought to the Hôtel Excelsior by truck. Brunner stood on a second story balcony that could have been the very one we felt so lucky to have been given on our first stay at the hotel and watched the prisoners arrive. The SS took their money, jewelry, and other possessions, tortured many for leads to other Jews—relatives, friends, and acquaintances—and kept them in the hotel. Reportedly, they sterilized some of the young women then sent them to service German soldiers on the eastern front. Milked dry, the captives were eventually taken in groups to the end of the block, up the stairs, and across the street into the station—the route we retraced in reverse when we first arrived at the hotel—to board trains to the internment camp in Drancy, outside Paris. From there they were transported in freight cars to Auschwitz to be exterminated. About three thousand Jews—old and young, rich and poor, from Nice, other parts of France, and other parts of Europe, tradesmen, businessmen, housewives, intellectuals, artists---were sent through the Hôtel Excelsior to Drancy. Most of them died in Auschwitz. 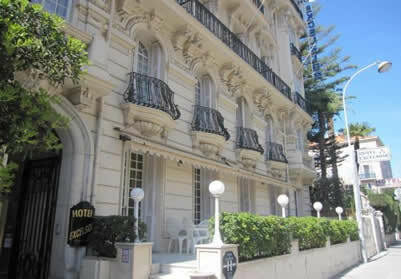 If the plumbing hadn’t gone berserk and the hotel manager hadn’t had a psychological meltdown and kicked us out, who knows how long my husband and I would have continued using the Hôtel Excelsior for our occasional stays in Nice. Internet images on the booking sites show that modernized decor has now replaced the hotel’s period charm, so we might have moved on, but, as I said, who knows. 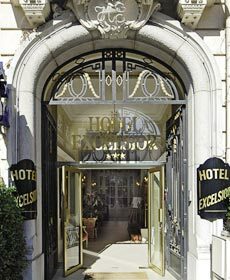 If we had indeed remained clients and I had been reading about the Hôtel Excelsior’s accursed history on the very site of the hell that it became, that would have been the bad hotel experience that surpasses all others. And, needless to say, something I would never forget.